Prime minister says 'any responsible leader' faced with growing threats would raise defense budget, as dispute with Lapid deepens. Prime Minister Binyamin Netanyahu on Monday held a traditional toast ahead of the Jewish New Year (Rosh Hashana) for employees of his office, in which he called for a "significant increase" in the defense budget following Operation Protective Edge. "Any responsible leader, in the face of the increasing threats around us, would demand and make possible a significant increase in the defense budget given the reality and the growing security challenges around us and this is what we will do, a significant increase of many billions," stated Netanyahu. The statements come as Netanyahu and Defense Minister Moshe Ya'alon have been pushing for an increase in defense spending - a move Finance Minister Yair Lapid has been fiercely opposing. The dispute partially revolves around the cost of the operation, with Ya'alon pricing it at nine billion shekels ($2.5 billion) and Lapid saying it cost only 6.5 billion shekels ($1.8 billion). The difference means Lapid is unlikely to allocate the full amount being requested. Reportedly Lapid's Finance Ministry wants to limit the grant to restock military supplies, including those used in the expensive Iron Dome anti-missile defense system, to $690 million. Netanyahu on Monday also spoke about the wider issues facing the Middle East, and again compared the Hamas terrorist organization with Islamic State (ISIS), a comparison Senate Majority Leader Harry Reid (D-NV) affirmed recently as he decried the hypocritical difference in world reaction to the two groups. Speaking about ISIS, Netanyahu noted "dozens of countries are confronting a body that is more or less the size of Hamas." "You certainly see that the Middle East is changing very rapidly. ...States are breaking up and out of the ground and the sand are rising extremist Shi'ite and Sunni organizations that are competing with each other... But they all have one position - that we don't need to be here," said Netanyahu. 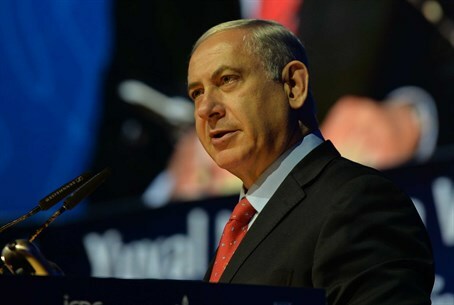 "We know that we have been engaged in the struggle for our existence since the dawn of Zionism, both before and after the establishment of the state," added the prime minister. "One of the great things that we are doing, between (military) campaigns, while extending our hand to those of our neighbors who want peace, is to build up our state." Ironically, Netanyahu has been accused recently of enforcing a covert construction freeze in Judea and Samaria, silently stopping Jewish building projects despite the housing crisis hittin gIsrael. It it worth noting that Netanyahu's approval ratings plummeted in the last campaign, apparently due to a perceived lack of decisive military action against Hamas. Netanyahu's approval went from 82% at the height of the campaign to a paltry 32% after he sealed a ceasefire with the terrorist organization of Hamas.